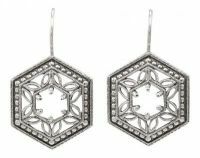 A 5.0mm round 6 prong setting with a hexagon shaped frame that has a beaded edging and filigree with millgrain detailing. 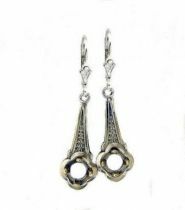 Fits two 5.0mm round stones or .50 carat diamonds in a 4 pronged dangle setting. Sold as a setting only, gemstones are optional. Cast per order using molds of the original hand carved dies.